All Duct Out - Rip, Wrap and Wear. 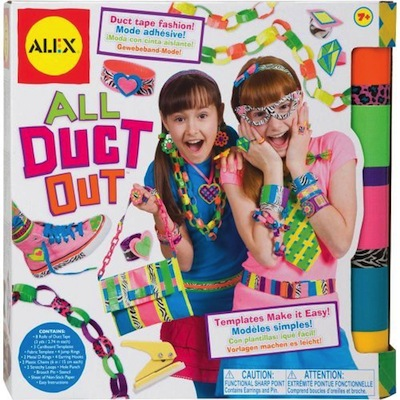 Create fab fashion with brightly colored and patterned duct tape. Templates make it easy. Ideas include belts, jewelry, bags and more. Includes 8 rolls of Duct Tape (3 yds ea), 3 cardboard templates, fabric template, 4 jump rings, 2 metal d-rings, 4 earring hooks, 2 plastic chains, and much more. Ages 7 and up.